Detached chalet, entirely of wood, new construction completed in May 2018. Modern comfort, cozy and warm. Very nice fully equipped kitchen open to the living room, very large walk-in shower, separate toilet. On the floor, 3 independent rooms (1 X reads 160, 1 X reads 140 and 1 X 2 separate beds). Large master bedroom with balcony. WC on the floor. Located in a quiet street. Nice terrace at the back of the chalet equipped with a barbecue, garden furniture and deck chairs. 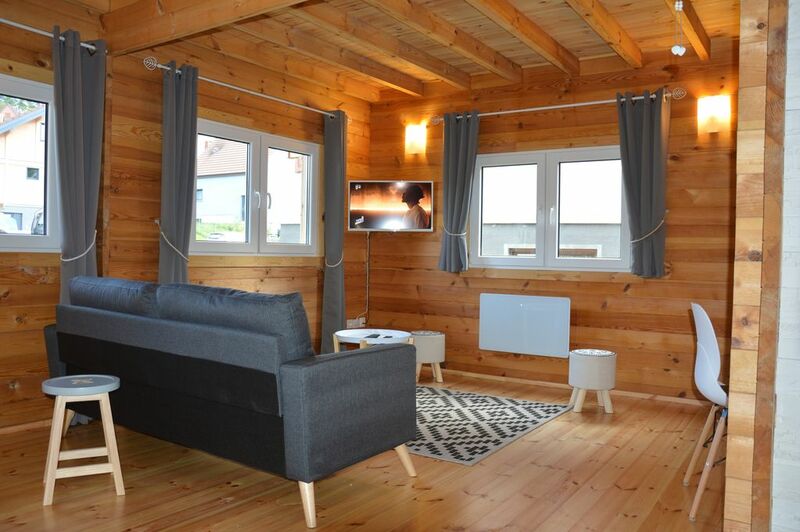 The chalet is located in a beautiful green setting, ideal for walkers and nature lovers. Its location in the center of Alsace is ideal for discovering all the tourist attractions of Alsace. Neubois is located 15 minutes from the castle of Haut-Koenigsbourg, close to the wine route, 45 minutes from Europa Park in Germany. Excellent location between Strasbourg and Colmar, at the foot of the Vosges. In winter, the Champ du Feu ski resort is 15 minutes away. We had an incredible stay here. Neubois is a peaceful and idyllic setting and this chalet was everything we hoped for during our trip to Alsace. The kitchen is fully stocked with everything we needed to prepare breakfast and dinner, including coffee and teas and a few basic pantry items like olive oil. The staircase is very steep, but for families with small children there is a baby gate at the top. There is a toilet on each floor, and a lovely shower with a washing machine. Linens were included, but we had to bring our own bath towels. Mme Mathieu was very kind and helpful as well. Overall, I cannot say enough about how enjoyable it was to stay here. Thank you very much for your kind message. It was a real pleasure for me to meet your lovely family. Very nice house, big size bedrooms. Throughly modern build and very clean. Annette as a host was also extremely helpful. Location is very central in the pretty village of Neubous and close to all the nearby Alsacian villages and 5 mins from the main Wine Route. Car is essential. Thanks a lot for your trust. Wunderbar für unser Wochenende mit Freunden! Super nette und schnelle Kommunikation auf alle Fragen, sehr hilfsbereite Gastgeberin und unkomplizierter Checkin und Checkout. Gerne wieder! Hallo Frau Peuser und vielen Dank für die netten Zeilen. Es hat mich sehr gefreut, Sie und Ihre Freunde kennen zu lernen. Ich bedanke mich für ihr Vertrauen und wünsche ihnen alles Gute. Les propriétaires sont sympathiques et très disponible. Bonjour et merci pour votre commentaire, j'ai été ravie de rencontrer votre sympathique famille et serais très heureuse de vous recevoir à nouveau pour un prochain week-end. Das Chalet ist sehr schön und super gemütlich. Die Einrichtung der Küche ist sehr umfangreich.